May | 2012 | Run. Work. Live. Repeat. Hello, Abs!! Nice to meet you, Core!! Eleven days ago I started doing the “Insanity” workout series on DVD. It was my Mother’s Day gift to myself. Holy crunches! It is ridiculously hard BUT I like it … so far. The first few days my glutes and shoulders ached like they haven’t in a very, very long time. 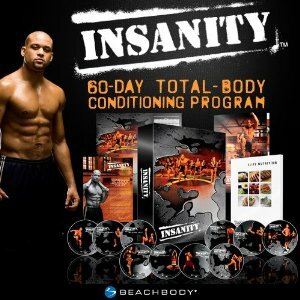 “Insanity” is a DVD series produced by Beachbody. The instructor is choreographer “Shaun T.” You’ve probably seen it on Sunday morning infomercials. The Insanity regime and diet promises you to transform you from mush to hard-body within 60 days. Insanity peaked my interest because I have friends on Dailymile who’ve followed Insanity and other programs like it such as P90X and they swear by them. I also turned to “Insanity” for a bigger reason: After I finished Boston last year and my BQ honeymoon was over, I felt let down. I needed another goal. How DO you top your running goals after you qualified for Boston, and you have run the Boston Marathon? Do you even NEED to top that? These are questions I have been asking of myself now for awhile. It’s sort like any big event in your life and the aftermath. How do you deal with the hype when it’s all over? Boston has been that way for me. I like setting my sights on new goals and I’ve been struggling to find my next one. The idea of running an ultra (a race longer than 26.2 miles) appeals to me; however, the training does not fit into my lifestyle right now. Enter “Insanity” into my life. No, I can’t plan for an ultra at the moment but I CAN get in better shape. Insanity comes with a schedule of which specific workouts and DVDs to do each day; you work out six days a week and rest completely one day a week. Each session is roughly 40 minutes. You start with a warm-up (about 10 minutes); then there’s stretching (5 minutes), high-intensity intervals (20 minutes), and a cool-down and more stretching (5 minutes). It doesn’t sound like much at first, especially compared to hours and hours on end of running day in and day out, but in essence it’s boot camp everyday, microwaved. You work at an extreme intensity for a quick duration. Whereas traditional interval training might get your heart rate up for 30 seconds and then have you rest, with Insanity you get your heart rate up for three minutes straight during the intervals with only a 30-second recovery, and then go again and again. Each time I finish a workout I end up sweating more than a pitcher of Coors sitting out in the July sun at Mile High Stadium. And “Shaun T.” gets me hopping and jumping and squatting and push-upping and wide-legged sprinting like I’m Peyton Manning. I’ve joked to my husband that I think I’ll be ready for Broncos summer training camp at Dove Valley by the time “Shaun T.” is finished with me. You have to start somewhere, I guess. And it’s good to mix things up to get your body and new muscle groups stronger. Do you cross train, too? If so, what do you do? Have you ever tried Insanity or P90X? Elizabeth, aka “Lisa,” McClellan is on a streak these days. A streak of success with her running, that is. In March 2012, Lisa qualified for the Boston Marathon at the Shamrock Marathon in Virginia Beach (3:54; she will move up an age bracket next year, thus qualifying this time). In April she set several personal bests: The Rockstar 8K Race (37 minutes) and the Cherry Blossom 10-miler (1 hour 15 minutes). The 44-year-old mom of three and wife of a Navy Seal diver is in the best shape of her life and realizing her full potential — both in her personal life and as a runner and blogger (www.RunWiki.org). a few short years ago, though, life threw her a curve ball and that’s also what makes her BQ story inspiring. Like many women out there, Lisa experienced agonizing postpartum depression following the birth of her three children (a 6-year-old and 4-year-old twins). According to statistics from the Depression and Bipolar Support Alliance, the condition affects as many as one in 10 new moms. Lisa and I met through the Dailymile.com, and she has an awesome disposition. You’d never know she went through this until she shares it. Lisa is one of the kindest, most upbeat and supportive people I’ve met on DM. But, that, too, is one of the dark secrets about postpartum depression: it is a surprising twist that hits otherwise healthy people. Doctors don’t know why some women are more prone to it over others. What they do know about it: It is definitely real, a variation in normal body chemistry AND it usually comes back more severe with each subsequent pregnancy. It was through running, Lisa said, she found her way back from the depths of postpartum depression. Born and raised in Southern California, Lisa was a nature athlete in her youth and she ran cross country and track in high school. As an adult, she went in and out of phases of running. After the birth of her children, however, she stuck to it again. Lisa and her family have lived to many places because of her husband’s work. It was when they were sent to Washington, D.C., a few years she found her passion again for road racing. “I had raced many years ago, but entered a more recent race when we moved to D.C. I placed in the top ten. … It gave me a sense of accomplishments that I had not felt in quite some time. I was hooked, ” she said. Her husband, a Navy Seal (which also requires grueling physical training) and her children (6-year-old Jet and 4-year-old twins Corbin Rose and Tristan) are very supportive of her, she said. Her goals include to run Boston next year, better her BQ time and also to run an ultra marathon in July. “Whether it’s running or anything else, I think it’s important to encourage other women out there and other people to find their passion and to go for it,” she said. She and her husband, who have been married 7 years, met at Port Hueneme, when he was stationed there. They will return to California in July. In July, Lisa will run her first ultra: the North Face Endurance Challenge 50K in Washington, D.C.
After that she hopes to a run a November marathon and get even faster at that particular distance. Running — although it comes with challenges in balancing family time — keeps her feeling young and fit, she stressed, and she cross-trains to stay injury free. “Running makes me feel alive. I can’t imagine living a life not moving. I am more fit now than I have ever been in my life, that makes me feel very young,” she said. Mileage today: 4.1; Mileage for 2012: 456. Whenever I travel to a new place I run there if possible. I find it’s the best way to experience a place and meet its people. 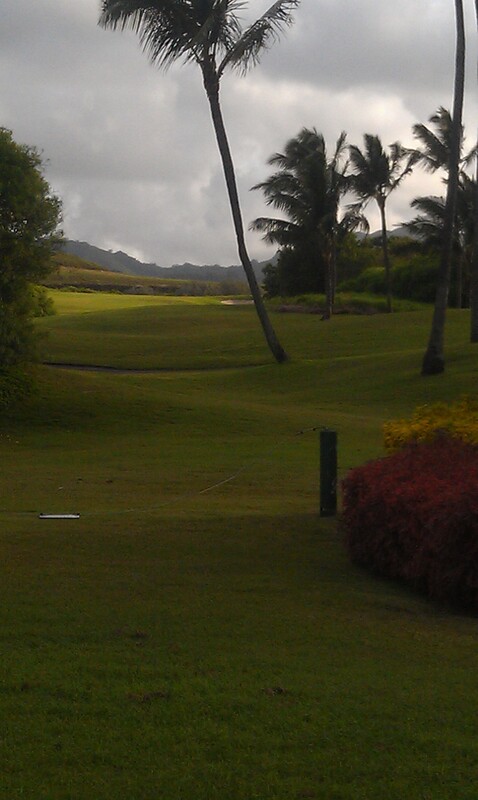 That’s also what I did in Kauai. 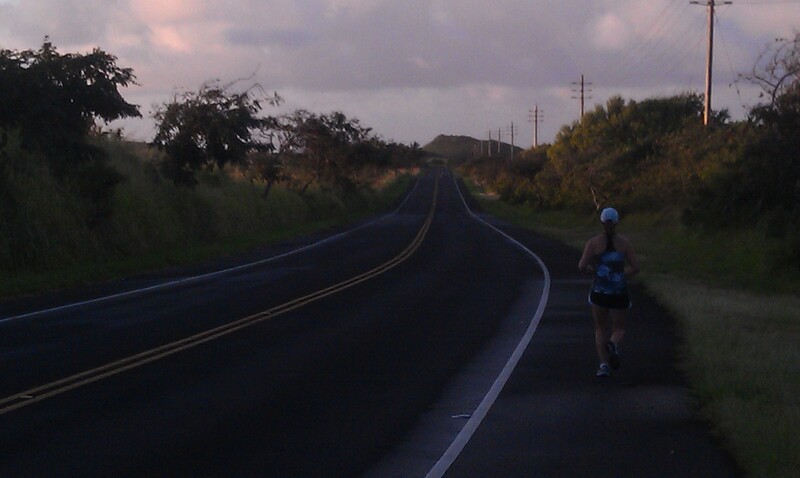 I loved running there. It was “The Blue Lagoon” meets jungle: rainforest, sandy beaches, palm trees, taro, orchids, emerald switchbacks and rolling hills. The Dude’s company provided a 6 a.m. sunrise group run or yoga each day we were there. It was terrific. Our guide was Jennifer, or “Jen,”who works at the spa at the Grand Hyatt as an aerobic and fitness instructor. She was super sweet and friendly, and I’m glad I got to meet her and get a local’s perspective on Kauai. She put all of us at ease and made sure we didn’t get lost and that no one was running alone. 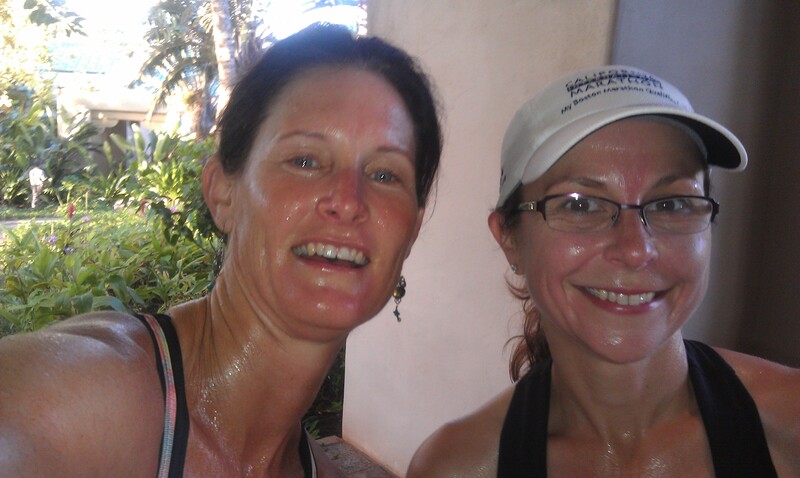 Me and our running guide, Jen, after our Day Two run. She picked a new place for us to run to each day. Mahalo Jen! There were usually a half dozen to dozen of us there to run with her. 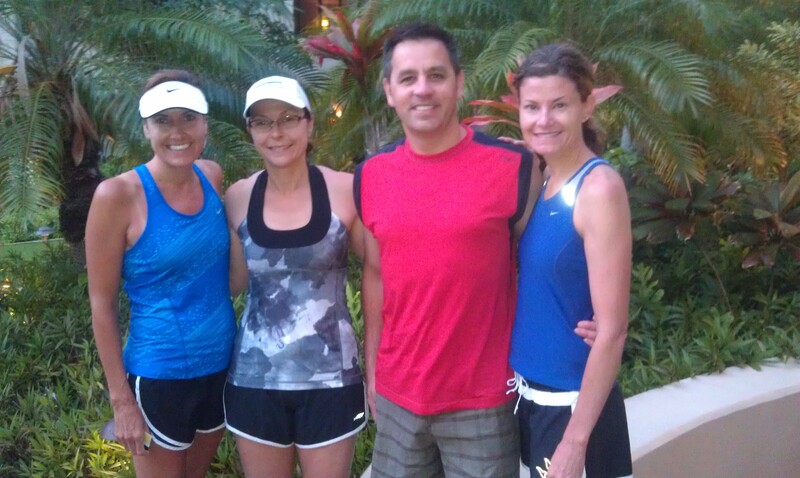 Me and some of the diehards who showed up regularly for the 6 a.m. group sunrise runs. 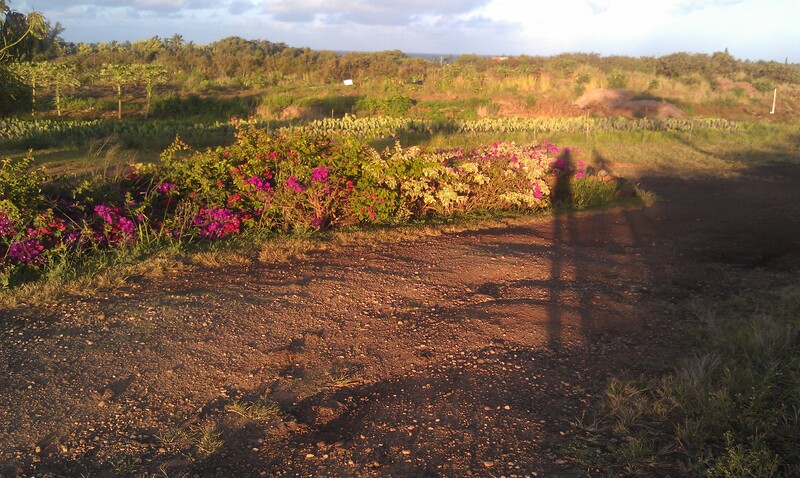 Day One, Jen took us on dirt roads from the hotel and to a trail that lead to the beach. It was 6 miles round-trip. Unfortunately I didn’t bring my camera but I did the next day. 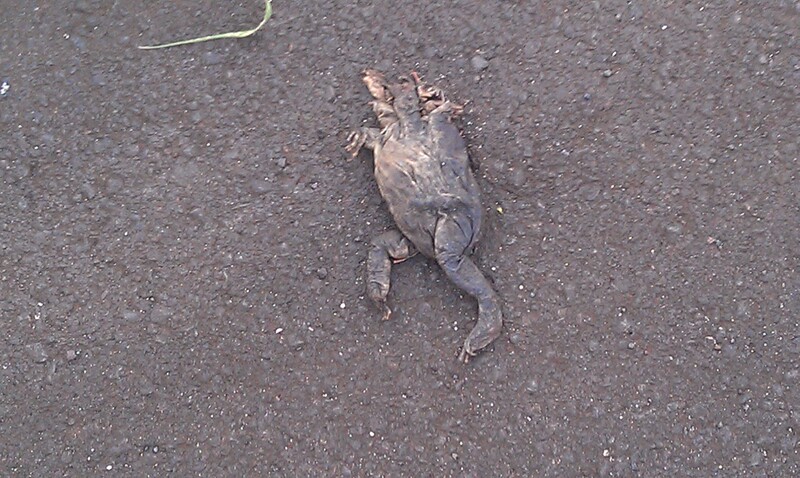 I don’t mean to gross you out, but, seriously, if you run in Kauai, you have to watch out for them. 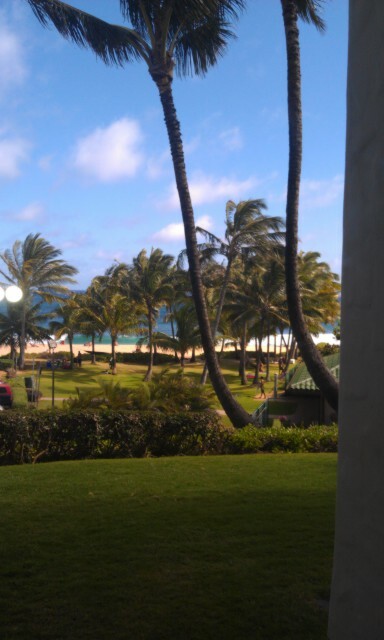 3) Just like Santa Feans, some Hawaiians are disgruntled with tourists. We almost got run over by a car on that first day along dirt roads. This surprised others in my group but not me. I lived in Santa Fe, another tourist haven, for 11 years. I explained it wasn’t about the environment but economics. In Santa Fe, for example, the median home price is $300,000, and the average hourly wage is $10.50. Do the math and the answer to that equation becomes clearer. I know in Santa Fe it’s not uncommon for people who live there to work a couple of jobs, just to get by, which can leave local people bitter. 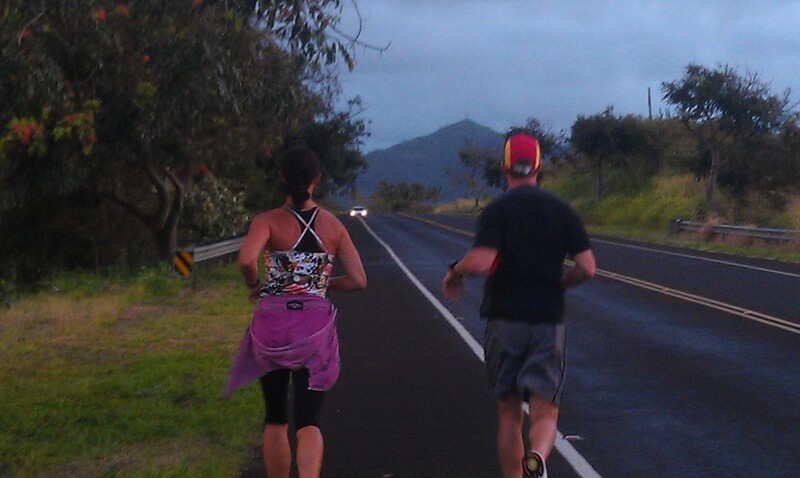 On Day Two, Jen and I got to run quite a bit together. She’s a transplant from northern California who’s lived there for several years. She told me that Hawaiians enjoy offbeat holiday such as Cinco de Mayo (which took place while I was there), rather than the big holidays such as Christmas and Thanksgiving. Jen took us up one of the highway roads on Day 2; it was hilly and lush — palms, ferns, taro and tropical flowers along the road, and of course — chickens! 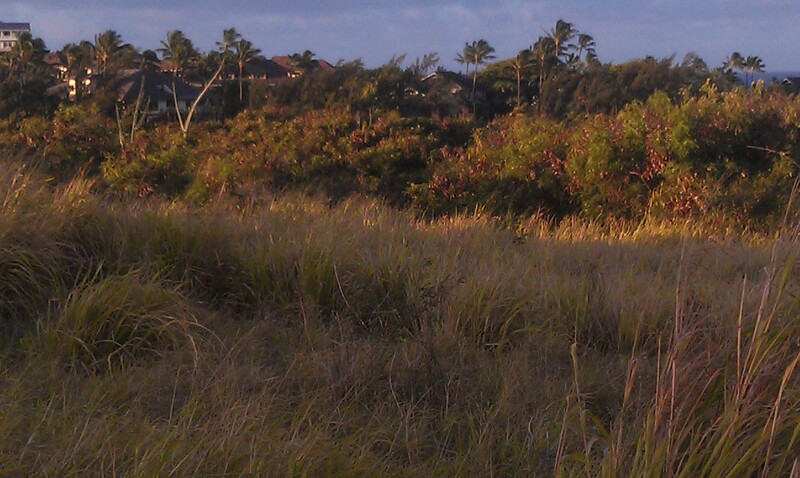 Kauai used to be full of sugar cane plantation but they have since closed. Sunrise run on Day Two — yes, that’s me. Each morning Jen mapped out a 6-mile option and gave us details if we wanted to go shorter or longer. I hoped to join the group for a third day but couldn’t because we did a snorkeling excursion that left at 7 a.m. I ended up running on my own the last two days of the trip. Jen also told me about a product line her boyfriend started called “Crazy Chicken.” If I came that third day she was going to show me some samples of it. It’s not on the web yet but I left my contact info so that when it is, I’ll show it on the blog. 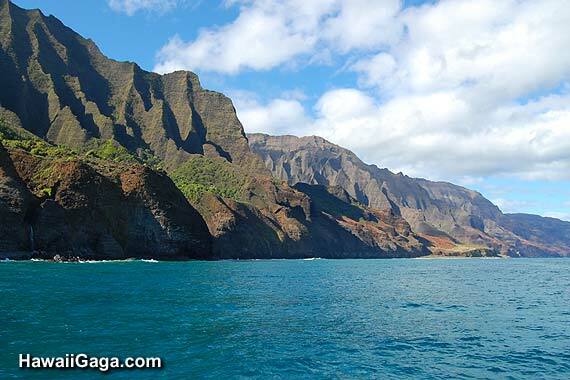 The Dude, Tarzan and Jane, and I also went a catamaran/snorkeling excursion along the Napali coastline. I was so impressed by the kids. They were such troopers and had never been in ocean water before. 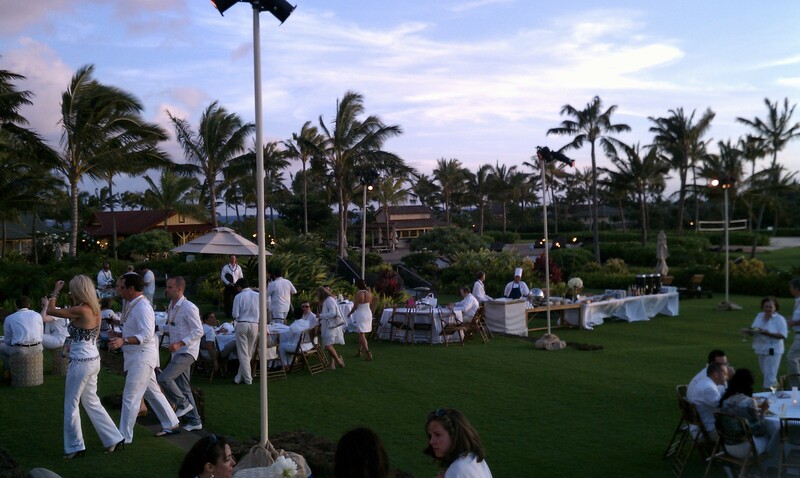 Sometimes the swells were bigger than our hotel suite but no one got green — whew!! Our boat stopped in one spot where we had about two dozen dolphins playing around us, very close to us, and at the snorkeling spot we swam along side sea turtles. The Napali coastline — where they filmed parts of “Jurassic Park,” “Part of the Caribbean” and “Six Days Seven Nights,” plus several music videos, according to our boat guide. Unfortunately I earned the “dufus award” on the day of our snorkeling/sailing excursion. I took my camera along only to find it had dead batteries. One of the guys from our group took tons of pictures and shots of us, too. He promised to email them to me. When he does, I’ll include them in a future post. Being in nature — the water and out running — is how I LOVE to connect to the world and with others. 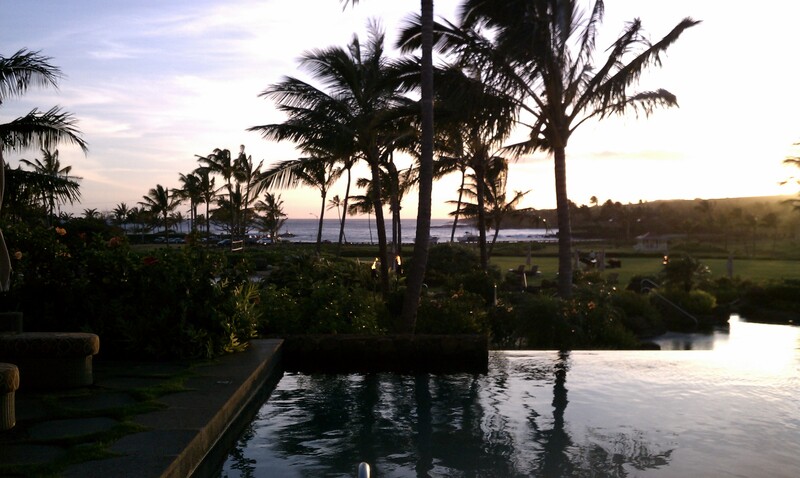 Although it’s hard to argue with country-club life at the pool AND being wined and dined, the snorkeling and running were definitely my favorites of Kauai. A funny tidbit: I had a “Pulp Fiction” at the hotel pool. I’m not much of a drinker, but when I heard one of the executives from the Dude’s company was buying drinks for everyone and a mai tai cost $14 and a kiddie shake was $5, I had to try them. Just like John Travolta’s character in that movie, I had to know if they were worth it. 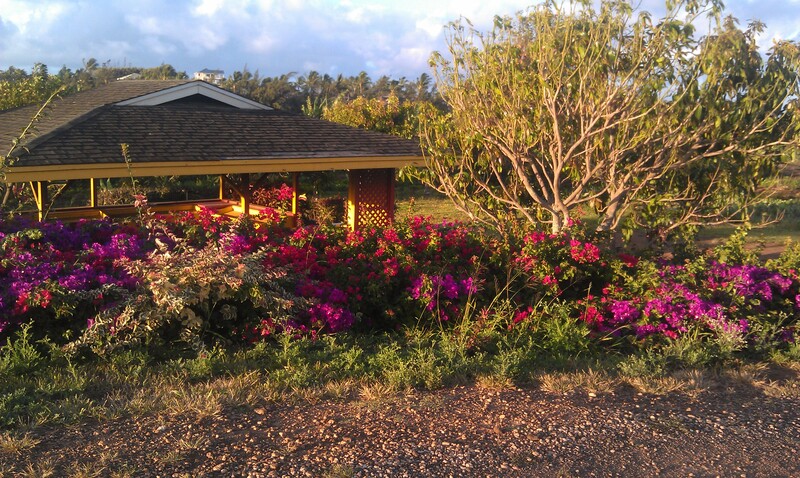 So was our island trip … worth it, that is. Aloha and mahalo Kauai! I hope we meet again. Mileage today: 4: Mileage for 2012: 451. If you’ve been wondering where I’ve been and why I have not written a post sooner, please forgive me. I’ve been on “island time” where I confess — the lazy pace was sweeter than the pineapple they served us everywhere we went. The Dude, Tarzan and Jane, and I have been in Kauai as part of “Chairman’s Club” — a sales award trip the Dude won at work. We just returned today. 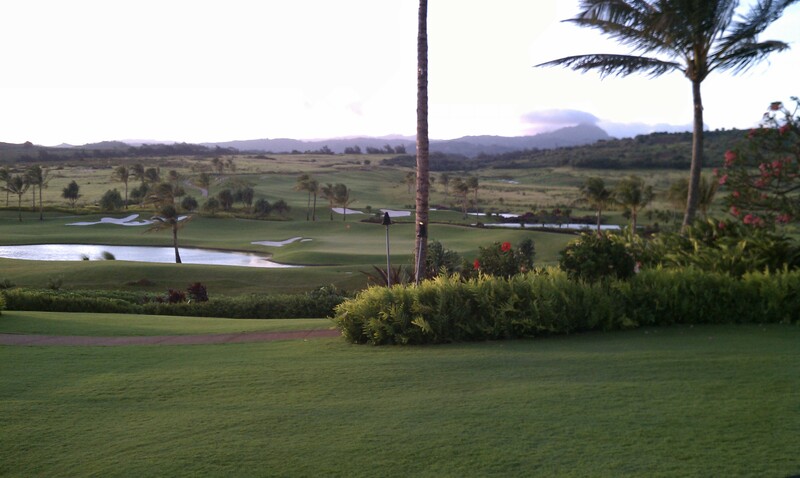 We spent 5 days at Grand Hyatt Kauai at Koloa — home to the PGA Grand Slam of Golf for many years. 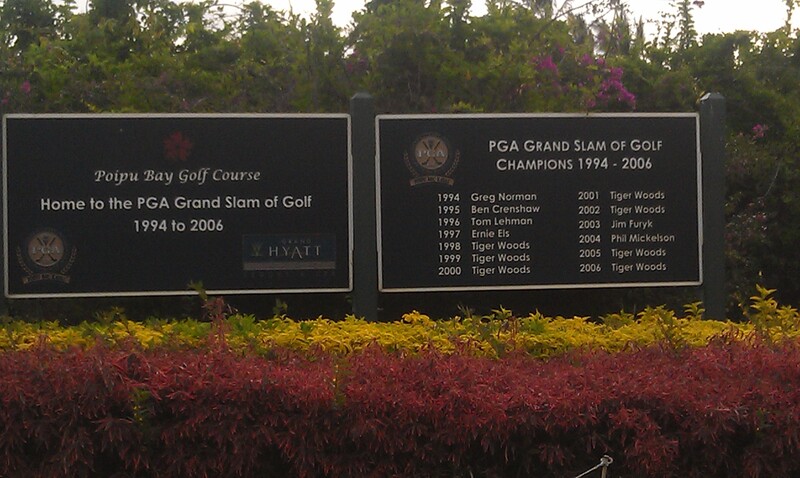 “Tiger turf” — the golf course across from our hotel where Tiger Woods reigned for many years.. The Dude’s company treated us like royalty during our stay — so well in fact, I think this might spoil our kids for the Indiana Dunes or car trips across the country in the future. 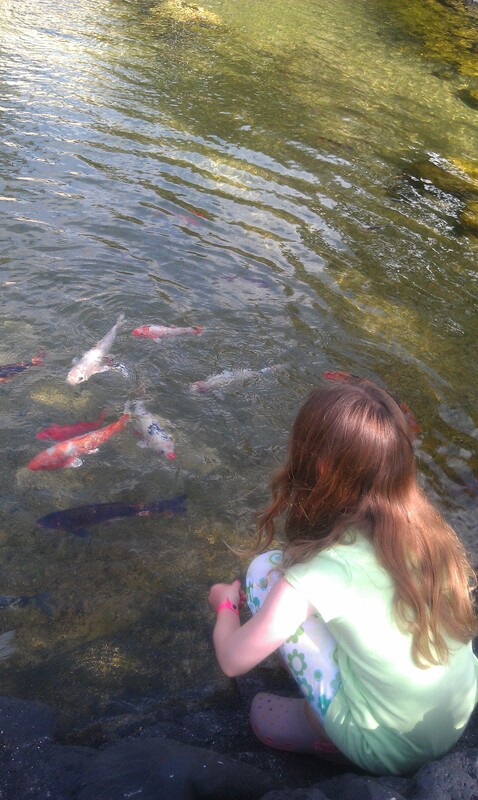 We got to lounge with them during the day at the pool, which included water slides, water falls, a lazy river and sheltered salt water lagoon. 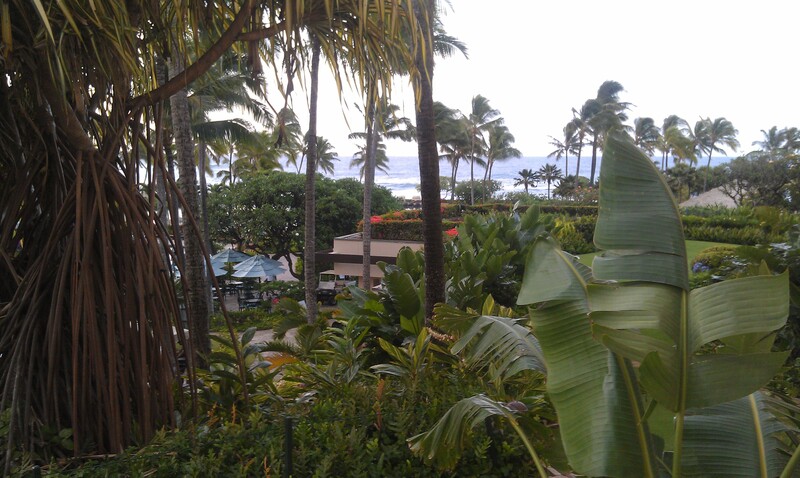 A view from one of decks at the hotel pools. 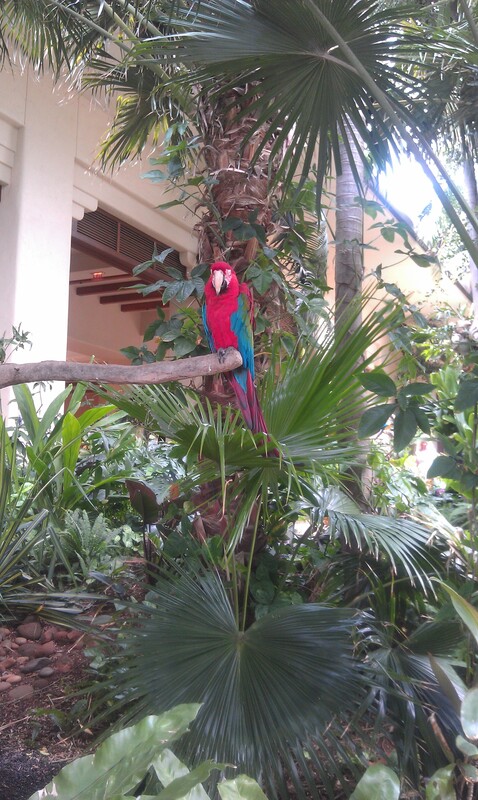 “Rico” — one of the many exotic birds who live in the lobby and along the grounds of the Grand Hyatt Kauai. 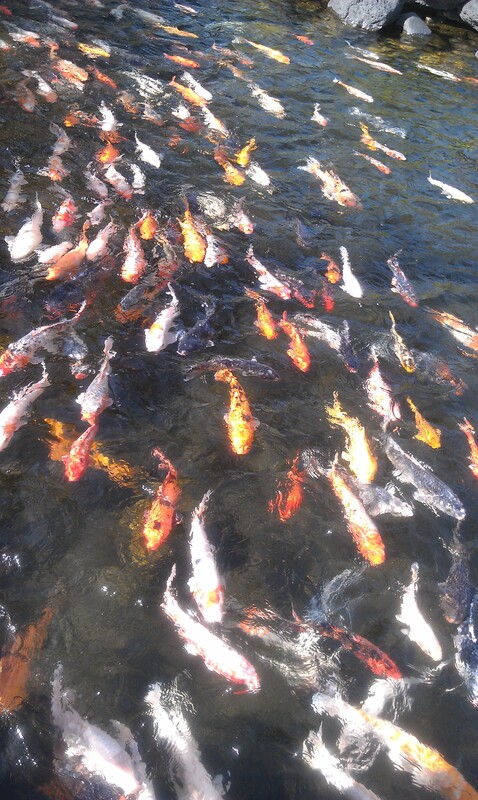 Coy fish during the daily feeding at the hotel each morning. 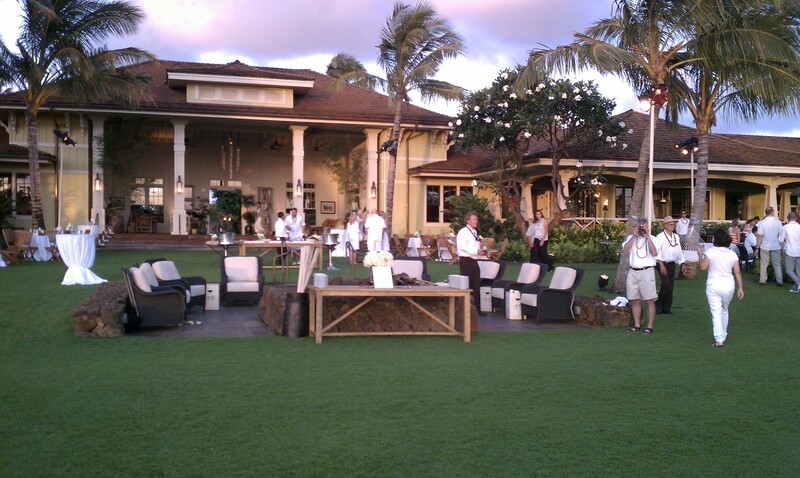 At night we dined at catered events for the Dude’s company such as this one at a former sugar cane plantation residence. My favorite part of the trip, however, was — you guessed it — running in Kauai AND a snorkeling excursion we did with our kids along the Napali coastline. I’m going to share a few of my running photos tonight and continue with another post tomorrow. For those of you unfamiliar with Kauai, however, I will also tell you this before I go: Kauai is one of the least developed of the Hawaiian islands. 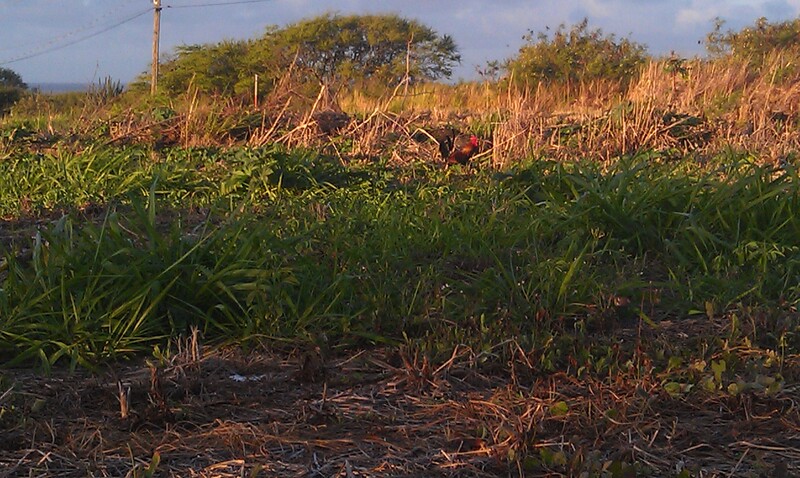 When you run there, you see wild chicken EVERYWHERE. 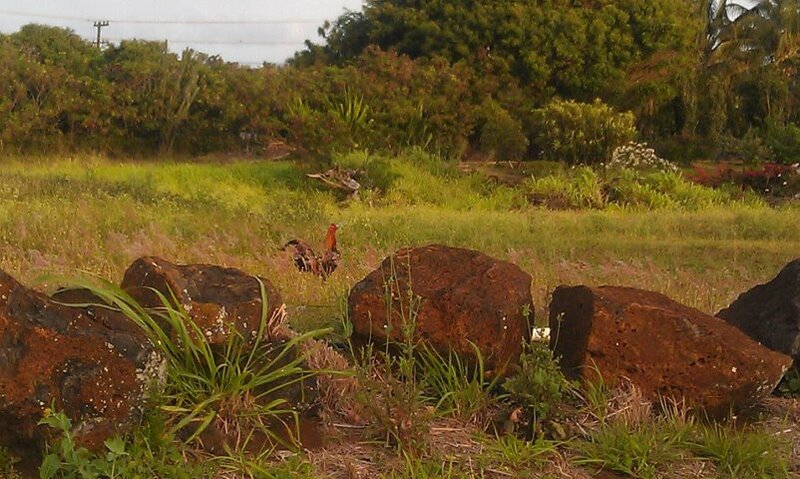 King of the Road — Roosters and wild chickens are the “masters” of Kauai’s trails. Until tomorrow, I will leave you with island ukelele music to keep you in the mood. FYI, this young woman, Taimane Gardner,, and her band (two accompanying guitarists) performed for us during one of the company’s functions. She’s outstanding. A scene from the movie, “The Way,” A Film by Emilio Estevez, 2011. “Jane,” my 9-year-old, loves “imagination time” — playing by herself sometimes in her room. I can always tell when she’s immersed in “imagination time.” Her voice will sound happy — high pitched and animated — even with the door closed — as she acts out characters and story lines she creates with her dolls. Running is the one window of time I get to myself on a consistent basis during this stage of my life and motherhood. For the artist in me, running is akin to the ER taking paddles to my chest — it brings my creative soul back to life. It gives me the time and space to sort and reflect on where I am now and where I hope to go next. Several weeks ago I watched a movie that struck a vein with me called “The Way.” It’s an indie film (now out on DVD). If you haven’t seen it already, I recommend it. It stars Martin Sheen and Emilio Estevez. It’s about a father and son, and how the father copes after his son, who was on a pilgrimage along the Camino de Santiago (the path of the apostle St. James), dies suddenly. The father decides to finish the trek for his son, carrying his cremated remains. Along the way, he embarks upon his own spiritual journey. Watching “The Way” made me want to run the Camino de Santiago (800 kilometers, starting in Frances and finishing in Spain) as a pilgrim someday. If and when I get to do it, I know it will be a long time from now — until after I’m done showing “Tarzan” and “Jane” their “way” in this world. That’s OK with me. This is one of the prevailing themes from “The Way”– that it is up to us to meet our life and live it to the fullest where we are now. It also makes this point: It’s easy to get caught up in the rush of the world today — but where are we going? And why are we in such a hurry to get there, especially when it seems that all we are doing is going in circles? Running helps me “live my life,” not just “choose.” It makes my life richer, helps me see my hopes and dreams in vibrant hues, and savor my blessings with prolonged sweetness. Each step and new each turn is a gift. I believe the truest source of our wisdom and creativity comes from the divine and God, and if you want to tap into the source, go out and run in nature. It’s “imagination time” in its purest form. Live well and run well, my friends. If this manic world ever starts to swallow you whole, take a cue from your children.